Château d’Yquem has secured its place in history as a wine legend with mysterious origins(brochure states established 1594, however their first vintage described by our guide was in 1666, same year as the great fire of London) family feuding owners and its illustrious place on top tables across the globe. Its name boasts an incredible aura in the wine marketplace but divides opinion throughout the wine world. No wine comes with such a price tag or story and yet chateau’s directly surrounding vineyards also make exquisite wines. By far the most expensive and longest aging white wine in the world, it’s often known as the noblest of noble rots. This estates prejudice ooze’s prestige and was finally snapped up by fashion house L.V.M.H. in 1999 adding to their bold brand name portfolio. Alexander de Lur Saluce, the Chateau’s previous long-serving owner left in 2003/4 well after L.V.M.H’s hostile takeover. He went on to work his magic on nearby Chateau de Fargues. This tiny wine area is 40 km south-east and can be reached by train from Bordeaux’s Saint Jean to Langon. City suburbs drift past before the bright green early summer vines appear into view and fill the landscape around. Passing through the sweet white wine areas of Fargues, Cérons and Barsac before reaching the small town of Langon just outside Sauternes. At Langon our pre-booked taxi awaited and we were quickly taken en-route to possibly one of the worlds most exclusive addresses possible. Necks creaked as we passed another famous Sauternes estate Château Rieussec which is now part of the Rothschild portfolio. By now my good friend Paddy was anxious, this was a big dream come true. He was like Joe Pesci in the film Goodfellas, it was like he was being a ‘made’ man. The half mile driveway was impressive. We both have been to many vineyards but this was quite a bit special. Being a little early, we took some photos of the grounds before being greeted by our host and invited into a modern tasting room. After meeting others for the tour, we were guided through the gardens. Over views of the vines and the valley below in the chateau grounds, we heard the history and unique methods of. Then downstairs to cellar and then back to tasting room to try the 2008 vintage, an quite exceptional wine. Chilled to perfection, fruit and honeyed notes were vibrant on the nose. This liquid gold’s flavours burst in the mouth with honey, fruit rich, orange zest and floral note. A wonderfully rich supple mouth-feel, the palate’s beautifully balanced acid and minerals leave you wanting more, so much more. This seemed quite a different experience to the 2004 vintage I had tried the previous year. This legendary Sauternes wine has sat at tables of Tsars, Royalty, Presidents and top society for centuries. Things are done a very particular way here. Such is the standard of Château d’Yquem wine, that they do not put out a vintage if the noble rot conditions are not right. Yes, a years work without an end product. Therefore, they had no vintage in 1910, 1915, 1930, 1951, 1952, 1964, 1972, 1974, 1992 and that’s even after pickers passed through the vines up to 11 times. Château d’Yquem is the highest point in the area with Landes pine forests below. The nearby rivers of the Garonne, has mild conditions and the Siron river has cool climate which combines in the valley below to create a foggy atmosphere, The unique micro-climate with fog in the morning followed by sunny and windy afternoons provides about 92 days fog a year. Rain in late September is favourable for bringing on Botrytis cinerea known as noble rot to the vines. The soil is also unique here, the Semillion grows in four different soil types; clay, sandy, limestone, gravely. Our guide told us that this area has a maritime climate even though 50km from the sea, in nearby St Croix du Mont St pre-historic oysters were found. 22 women and 17 men work the vineyards. The women look after 25,000 vines. In February tie the vines, April renew the ties, July strap, August remove the leaves. They do not green harvest but 1 week before harvest bad grapes are removed. There are 3 rots – Acid rot – has to be discarded tastes like vinegar. Grey rot – too wet, too much moisture & creates a dust. Noble rot – grapes are drier, fantastic depth of flavour like figs and raisins. There are 50 Chateau permanent workers and 150 temporary workers for harvest, mainly locals. During harvest, its possible to make 90 barrels a day and only d’Yquem grapes are pressed four times. Picking takes 2- 2.5 months, its different every year, some years it finishes only weeks before Christmas. Lawns were only turned into flowerbeds in 2009 with roses and lavender, wonderful smell of fresh cut grass when we visited. Cellar downstairs was built in 1987 but upstairs building dates back to 1826. 6 people work the cellar. A glass jar is used to seal the barrels after the sulphur added. d’Yquem is a botrytised 80% Sémillon 20% Sauvignon blanc and matured in new oak barrels for 2.5 years. “Y” (Ygrec) a dry white made here since 1959 is 75% Sauvignon Blanc 25% Sémillon but varies between vintages, made in 15 days, then in oak barrels for 10 months. The oldest existing bottles are 1784, 1787, the Thomas Jefferson bottles but these have possibly a tarnished reputation since mentioned in a wine fake scandal that has rocked the wine world. Most expensive d’Yquem was a 1811 (comet vintage) sold at auction in London 2011 for 85,000 euro. Before 1999 bottles say Lur Saluce but since the takeover its just has the crown of their family name. 45% of company still owned by the Lur Saluce family and some still come to the Chateau every day. d’Yquem is the only one of Bordeaux’s first growths to have a female winemaker – Sandrine Garbay. d’Yquem uses same material as Euro notes for their labels to prevent wine fraud. One story we were told was how in 1847, the chateau owner went to Russia for a few months and when he came back they discovered the grapes had noble rot. But the guide dismissed this because the queen was not present at the vineyard at that time. They believe the Greeks discovered noble rot 5thcentury B.C. Just days after our visit the director of Chateau d’Yquem, Pierre Lurton (who took control in 2004) announced he was not releasing the 2011 vintage en primeur. Despite being named as wine of the vintage by several critics, Lurton has said in a letter to Bordeaux wine merchants that he will hold the wine back due to the ‘delicate context’ of the 2011 campaign. He said that he would rather ‘bring it out at a more suitable moment, one that suits the excellence of the wine in this vintage’. This roughly translates to; Red Bordeaux’s 2011 prices were falling fast but the 2011 Sauternes harvest was actually good, so they wanted some distance between themselves and the others to get the right price. This year the Chateau started picking Sauvignon Blanc on 5 September 2012. These early pickings are used for their dry white, Ygrec. 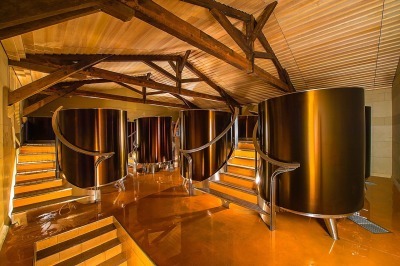 2012 is the first vintage Y’grec will be made in their brand new state-of-the-art vats (unfortunately not viewable on our visit). The good news for Chateau d’Yquem lovers was that rain that fell in late September, exactly what is needed to help with the development of botrytis or noble rot. The 2012 harvest started on 1st October and finished on the 8th November. The Chateau very kindly allowed me to take a small sample back for a special whisky tasting in which the whisky being presented was finished in d’Yquem barrels. Interestingly, I’ve still not come across a Bordeaux winemaker who knows what happens to their casks that end up being used for fine wine finished Scotch whisky. Although an old and rich heritage, Château d’Yquem has modernised its people & practices and uses social media better than most estates and businesses in the Bordeaux area. It continues to be a leading light and doesn’t compromise on excellence despite knowing its product depends on the weather. Alexander de Lur Saluces, longtime owner at Château d’Yquem may have been a bit crazy but I think his quote at the start of this post sums up the word excellence rather well. Excellence is not a sheen, or a sweeping phrase as seen on many company mission statements. A very special thanks to Château d’Yquem for this incredible insight to their world. If you want read more about their intriguing history, then I would recommend the book ‘Noble Rot’- by William Echikson, a fascinating read.